I am really enjoying Dead Space 3, even though it's not particular scary in any way. What I'm not enjoying is the all-too-frequent sentiment that "horror" and "cooperative play" are incompatible. As I say in the article, I think designers just need to balance vulnerability with reliability. It's not an alien idea, but I do think it's important to use these words in regards to system design. Alright, now for my favorite part, let's do a thought experiment. I want you to participate in the comments section if you have the time. 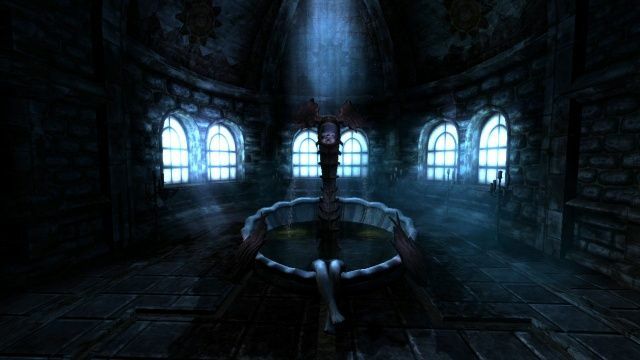 Question: How would co-op play affect Amnesia: The Dark Descent? Imagine exploring the ruined castle with a friend. Some missions split each of you up, forced to activate pieces of a puzzle in separate rooms. You cannot see what your partner sees, but you can hear them over voice chat as they start to breath heavily. Their voice comes out strained as their own fear rises, yet they try to remain calm as they describe a message written in blood on a wall, ghastly pictographs that you must understand to solve your own piece of the puzzle in another room entirely. As they describe the message, you hear them scream, their very own monster has shown up, and they wrestle with dual pressures: Do they flee or do continue their description, the one you need to progress. You solve the puzzle and continue onward when suddenly you spot movement. You jump in your seat before realizing it's just your partner, still alive, returning to your side. Moving forward the room darkens and your partner uses not one, but three tinder boxes to light your way. She's using your limited resources. You didn't need those there you argue, now your access to precious light is gone. Your partner's initiative has made you vulnerable in the dark. Together, your ally hears a sound you don't quite pick up. Are they messing with you? Is this a "you moved the Ouja board pointer" moment? Fearing the worst, you hide in a closet... which only fits one. Your partner yells out you for your betrayal. You slowly creak open the cupboard to see them being eaten a live by a terrible stalking beast. "She deserves it," you tell yourself, slowly closing the cupboard door. She shouldn't have wasted all that tinder. Could this work? Why give up when anything is possible? Thinking about this I'm actually reminded of a moment I hear about in one of the Kane and Lynch games, where in multiplayer across consoles both players see different things (one has schizophrenia I believe). Ever since hearing about that kind of thing I've always really wanted some kind of short horror video game experience that mirrors that kind of thing, bringing up that tension because you can't quite trust your allies, but also, absolutely have to. Re: Battlestar, not only do I know, I love it and own it! It's so hard to get a group of committed players together, but I adore Battlestar. The great thing about the traiter mechanic too is that you can't always be sure there even is a traitor. When this happens, accidents can become tension-filled moments of self-doubt. It asks players to create their own level of vulnerability, which is amazing. But, as you say, it's rare and hard to pull off.